Rather than transposing an elaborate description of "what to play when" -- for each instrument -- over every chord, arm your students with JazzDeck and try the following: "Class, find the card that matches the chord above measure one and turn it over. Solo using the color-coded notes." Each JazzDeck includes teaching cards that illustrate an approach that students can use to interpret the chord changes for themselves. Learn music theory while you play! 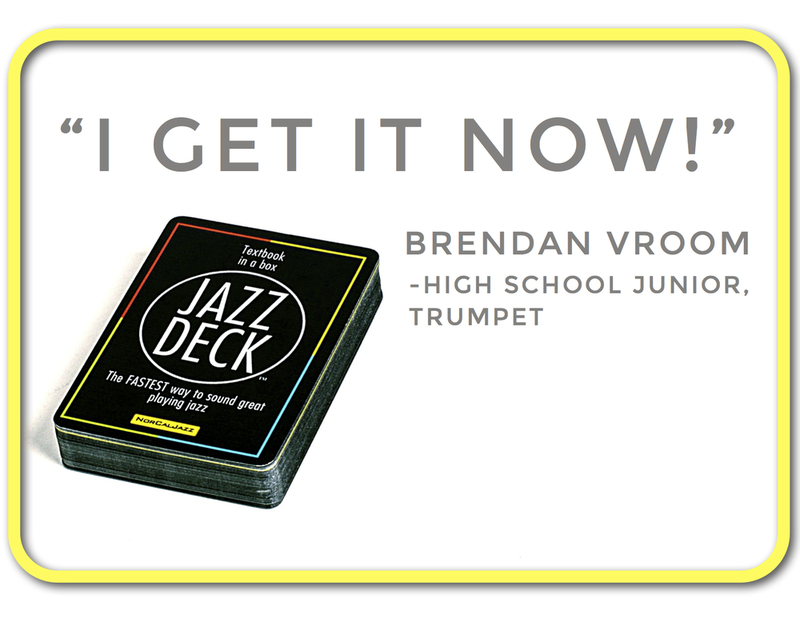 JazzDeck is the next big thing in Jazz education! JazzDeck will help students master chord changes faster and with more clarity than traditional music theory books. By breaking down the complex and overwhelming lexicon of jazz into tangible tidbits of musical information, this jazz method book helps students take a systematic and hands-on approach to learning improvised music. Learning music theory in an ensemble setting can require a significant investment of class time. Many directors forgo teaching improvisation in favor of working on concert pieces. JazzDeck will enable their students to interpret chord changes for themselves with their instruments in their hands. The multi-dimensional presentation of basic notes necessary to sound good over a given chord, followed by notes to sound great, is suitable for players of all levels. Those who always wanted to learn how to play jazz but were intimidated by the chord changes will succeed with JazzDeck. Join our community of players, teachers and students receiving free instructional videos and lesson plans.